Slice or cube salmon fillets, salt lightly, set aside. Cook pasta as instructed from the pack. Heat olive oil in a pan, then add butter. On medium heat, sweat chopped onions in the pan. Pour in cream and simmer a couple minutes. Mix in grated cheese in the cream sauce until melted. Simmer for a few more minutes then turn off heat. Check pasta if al dente, drain and set aside. Toss spaghetti in the creamy salmon sauce and plate. 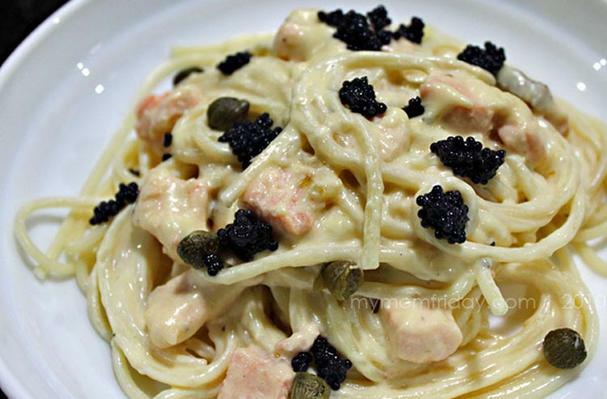 Finally, top the dish with caviar. Garnish with capers and parsley if you wish. Serve immediately. Best with toasted garlic-rubbed baguette. If you wish to use gravlax or smoked salmon, you may skip cooking the salmon with the cream and simply top the plated dish with slivers of salmon and caviar.